please subscribe to this blog. click the button at right. If you agree with this post, please share as widely as possible. 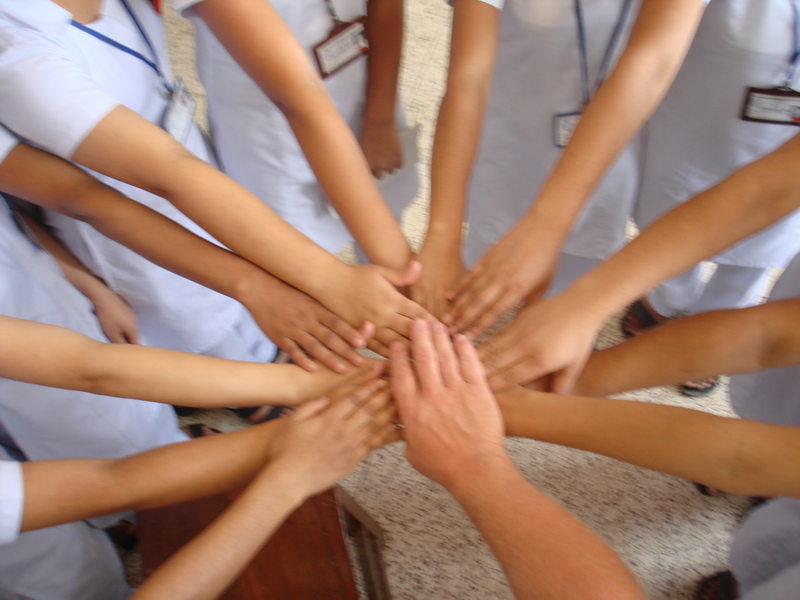 together, we can work to improve the daily worklife of every nurse and every nursing student. If you have been a nurse for any length of time, you develop a sixth sense for this. The minute you walk on to the patient care area, you get a vibe of what it’s like there. It may be calm and peaceful, it may be chaos, it can be happy or tense. It can be this way independently of how much nursing care the patients require. When you interview for a nursing job, be advised: the best managers know about workplace culture, and they are looking to add staff who will value it and honor it. A theme of this blog has been to encourage new nurses to live up to their caring potential, and it includes caring for those around them as well as for the patients. My first nursing job was not a place for teamwork. It was an “urban community hospital” and chronically understaffed. Each shift was a contest to see whether you could get through all the work yourself, and the assignment was heavy. It was a trauma ward, lots of gunshot wounds and stabbings and victims of beatings, along with a population of heroin addicts and homeless persons. Lots of crime victims. The staff consisted of a head nurse who had worked there since the dawn of time, and each spring there was a fresh crop of new graduate RNs. The hospital would hire a batch of new grads all at once, they would stay a year, then leave once they got “the golden year” of hospital experience. Or at least they were planning to leave then; most left my particular unit before hand, chewed up by the system of unsupportive coworkers. The crew of nurses aides were all older than the young RNs. We did “walking rounds” there, change-of-shift report consisted of a procession of sorts, all the nurses in a group following the kardex from bed to bed like it was the Bible at the beginning of Mass. The circus was led by the head nurse, same age as my mother. She generally arrived each morning with an attitude, and would heavily criticise the night nurse, pouncing on any inconsistency she found between the way the patient looked and what was written in the kardex; or how the story was presented. Very theatrical. As report was read, she would examine each patient (“you said the IV was NS w 40 of K, why is it I see a bag of LR hanging?”) This included getting on her hands and knees to look under the bed, on occasion, as well as barbed sarcasm. Every day. One day she chased a rat out of the ward, to the cheers of the rest of us…. but that is a whole nother story ( it was a very large and well fed rat). Yes, she was teaching us how to have standards and to follow them; but nowadays we would call her approach “horizontal violence’ or “verbal abuse” or “eating the young.” That was the way it was in that time and place. These days there is a national movement toward something called “Magnet Culture” – hopefully to eradicate that sort of approach. UPDATE: a former student emailed me after reading this, to alert me to some excellent work published by Sigma Theta Tau about Bullying in the Nursing Workplace. I was on eight-hour shifts, a day night rotation and soon found myself working nights about eighty percent of the time – the only time I was on days was on the head nurse’s weekend off. The day I passed my Boards I was Charge RN whenever I showed up from then on. That was how I spent my first year as an RN. Since I was on nights so much, it meant that I got to be the person going through the gauntlet every morning. And yes, I did well at it – better than the others. In those days I could be just as sarcastic and unforgiving as others. I would spit it right back at the head nurse, to the astonishment of other first-year RNs on the crew. I no longer treat others that way. The usual night staffing was two RNs for up to thirty patients, and even then, I went out of my way to help the other RN be ready, which was appreciated. I promised myself I would never be the kind of nurse manager that I was now working for, and that if I ever had anything to do with it, I would be kind and respectful. In other words, it was the Work Culture from Hell. Got the picture? I can go on and on – you got me started, but like a bad dream, I need to wake up and remember that this degree of dysfunction is not the way to go through life. Let’s focus on positive ways to interact, here. Teaching workgroup culture. learn it and live it. What I do now is to incorporate healthy work behaviors into nursing school. Nursing school is not simply to learn about patient care; it’s to learn the way a professional person acts and thinks. Sometimes in the Fundamentals lab, a student acts as though the only thing they are there to accomplish is to learn how to perform a specific skill according to the checklist. They don’t care whether others also learn, and don’t help their classmates or spend time coaching somebody slower to grasp the concept. Somehow there is a subset of students who think it’s okay to be a jerk to those around them while they focus on their own learning needs. This may work for Jack Sparrow, but will not lead to success in a hospital workplace. This tells me that such a student has a learning opportunity. Focusing on yourself is not the way to go through life. You are missing a major part of the ride. Want to develop the habits of a helpful work group culture? here are some ideas. They are not a “Code” – more like Guidelines. In both lab and clinical: Your work is not finished until the work of everybody is finished. Nobody sits down until everybody is able to sit down. If one person is getting swamped, we pitch in and help them. In the lab, it’s the students and faculty together, who tidy up and make the lab ready for the next group of students. Don’t rely on somebody else to clean up after you. In the clinical setting: learn about each other’s patients. Depending on how morning report is handled, this can be a challenge. If it’s a group report that’s easy; but if it is nurse-to-nurse report, you have to go out of your way to do this. Find a way to check in with the other staff nurses (or the other students) after an hour or so. Nobody lifts or transfers any patient by themselves. There is a strong evidence-base out there regarding nurses and prevention of back injuries, so we have an important reason for this. Some wards have many “heavy” patients, and this attitude makes a big difference. But it’s also a chance to create and strengthen relationships among the staff. say thank you. this goes a long way. there’s an old saying that “People may forget what you did or said but they won’t forget how you made them feel.” think about it. use names. there is a parade of people through every hospital area every day. Learn who they are, and use their name in conversation. You don’t have to go to Happy Hour with them or learn their kids’ names, but why not humanize the workplace? this includes housekeeping, the docs – everyone. name tags. Ever been in a college class where the professor never learned your name, even by the end of the semester? At my nursing school, we teach the same course to a different cohort each semester, there are fiftysix or sixty new names to learn. On the first day I always set up a system of using name tags, keeping them at the lab. The students collect at the end of each session. We call each of the students by name. They are not allowed to melt into the woodwork, which is often a surprise for the students. Huddle. this picture was taken in Nepal, but any of my students will recognize this gesture. When I wave my hand at waist level, they know that I want them to approach. I never have to raise my voice when calling them over. (and yes, they know i will not bite…) At lab and clinical practice, I call a huddle every now and again. soon the students learn to call their own huddles without me. Communication is a big part of teamwork. We use the time to share and to plan out our work and get ideas. The fact is, we all have a choice to create a healthy work culture, or not. which will you choose? Please elaborate with a list of what you thought to be eccentric. Enquiring minds want to know (not just in Honolulu but from among my vast worldwide readership). The eccentricities I recall: The mandatory name tags at every class/dry lab; the “huddles” in clinical when we had to all get together and do something as a group such as learn something significant or prepare to experience a learning opportunity in a patient’s room, requiring each of us to put our right hand in as pictured above…and the kazoo/flute. Whatever you want to call it. The little whistle you would whistle when it was time to huddle or when you had something important to say and we had to pay attention. We were all conditioned by the end to jump to attention when we heard the little whistle going. We knew that Joe was about to pontificate on something or simply change gears and move on to the next task. Thanks for the interesting article. The most important recommendation you make is the one where nobody sits down until everybody can! I love that. Good for you! I can really relate to your sentiment after spending two and a-half years on a med/surg unit as a patient care assistant while working my way through nursing school. It was brutal in so many ways — the nasty demeaning attitudes, laziness, constant backstabbing, and lack of teamwork that was common practice was nauseating. I would run from one end of the unit to the other at times (1:16) and pass by the nursing station where the RNs would be carrying on, laughing about a post on Facebook or while shopping online. It was unconscionable. I stayed a year too long on the unit — it’s perhaps colored my perspective of the profession. I graduated last May and passed NCLEX in July, and have still not found a nursing job. I wonder if the painful situation described above has something to do with it. Do I really want to subject myself to more of the same? Beyond that, the situation is very bad right now for new grads, at least here in California. After all the hard work, to be treated like an incompetent, inexperienced drain on the profession — even though I possess an RN license — has been especially difficult to handle. It’s as if those in charge now were NEVER new grad RNs. They have found a new way to be mean and nasty to those of us just beginning our careers by preventing us the opportunity to get the experience we need to be successful in our practice. It’s a culture that badly needs changing. I understand they may be overworked and exhausted, and to take on preceptorship of a new grad is just one more thing they’d rather not do, but it’s part of nursing — and they should extend professionalism toward those who just might make their lives at work better in the long run. So much can be accomplished when the team works together and trust on the unit is valued. Hospital administrators who slash training programs for new grad RNs are behaving equally irresponsibly. Please send me a copy of the nursing school lab handout that you mentioned in the article. I would love to read it and forward it on to my instructors. Thanks for your insight and caring enough to share it. Thank you for this honest appraisal of the work situation in that place. you raise some good points here. One is why more nurses aren’t writing to say how terrible things can be. For that, an easy answer: It doesn’t have to be that way, and the trick is to focus on how to change and improve, not dwelling on the bitching and backbiting. It’s actually very easy to create and stay in the kind of negative rut I described; there is even a term for it – “ward rage” – to describe staff nurses who come to work angry and stay that way. There have been nursing writers who go around giving talks on how it was better in the good old days – which by the way, it was not. Some things I left out from the orginal telling of this tale: the person who was the head nurse was reported to the State Board of Nursing; the nursing administration was reported to state hospitlal licensing; and the hospital union got involved in filing grievances against the more egregious practices. The union conducted a publicity campaign the following year (after I left to go to grad school) to get more government funding for the hospital, with some success and improvement. All of this took work, perseverance and courage. For this blog, I am giving advice to the new nurses – and the collective action needed to create and followup on the dialog is too much to ask for a new graduate who is just getting started. With all my heart, I want every new grad who reads this blog, to find the job of their dreams where they can learn and grow. There was a nurse author who wrote NURSE ABUSE, a book I reviewed on Amazon. (now out of print, deservedly so). That particular book is useless. It exemplifies this idea of getting it off your chest by complaining. Unfortunately that particular book stops at that point. We all own the problem, and we all need to work together to create the best future. it’s much more productive to find solutions and implement them. That’s why Magnet, and these other efforts, are so important. Join ANA when you are working and can afford the dues. The economy is terrible even for RN’s here. To get experience, I volunteer with the local Public Health reserve corps and have also joined a retired nurse who does health screening at a nearby food bank. Food bank patrons have a variety of untreated problems; we make referrals to clinics and give basic health information on hypertension, smoking cessation, diet etc. ANA dues were OK when I was a student, but now that I’ve got my RN I can’t afford it. Perhaps ANA could adjust rates to reflect the new economy. There are reasons why 1/2 new grads leave the nursing profession within a year. Thank you for encouraging us to break the cycle of violence, and being a voice of sanity,. thank you for this email which validates the importance of this issue. I was at the website of the National Council of State Boards of Nursing (www.ncsbn.org) not too long ago, and there I read a statistic that 40% of new nurses hired into hospital jobs leave within their first year of employment. NCSBN has some interesting things to say on this subject, and they have assembled a national task force to look at ways to improve this. I have heard it said in the past that new RNs are totally shocked by the 360-degree neature of the feedback they get in a clinical milieu, as one of the main things that causes them to lose heart…. I am sure there are other issues as well, you don’t need to be a rocket scientist to come up with your own list. To give you perspective, when Marlene Kramer wrote “Reality Shock” thirtyfive years ago, a similar statistic was cited. to all students out there: when you take your research class, do a research project on this constellation of issues – role socialization, nursing workforce, etc….. it’s a valid field of scholarly endeavor…..